There's nothing more effective to opening doors - be it socially or professionally - than to flash a beaming smile. It almost always works, disarming even the staunchest of your critics, and forcing even your most ardent opponents to drop their guard. Unfortunately though, nature has not equipped all of us with the pearly whites to pull it off. As we age, the hair on one's head turns white, while the teeth in one's mouth turns yellow. Some would give anything to have that process work in reverse! Teeth Whitening Reviews: Does It Actually Work? At Home Teeth Whitening - Is it Worth It? To get an accurate idea of how much you'll pay, you first have to decide on which type of teeth whitening treatment to go for. To see the average costs that you'll pay, scroll to the bottom of this page. All options rely on varying concentrations of peroxide and application times. It's recommended that you talk to your dentist before you start whitening your teeth. How long it lasts - ​1 to 2 weeks after using, depending on your diet and lifestyle. Best suited for - very mildly stained teeth or anyone who wants to try an option without going to the dentist. Learn more about these products here. How long it lasts - ​Results vary depending on your lifestyle, however expect them to be pearly white for 3-12 months with proper care. How It works - A gel is applied to the teeth and an LED light is used to whiten the teeth over the course of an hour. The tooth surface is effectively dehydrated to achieve whitening. Once complete, you're given a take home kit for maintenance. How long it lasts - ​1 to 3 years after using, depending on your diet and lifestyle. Best suited for - mildly stained teeth. Zoom whitening is the most popular option and is a great choice for anyone who wants their teeth whitened once every few years. Read more about it here. How It works - these systems are more advance methods of teeth whitening that utilise specially formulated red gel and green light to whiten WITHOUT dehydrating the surface of the teeth. They result in a much more natural and longer lasting result, however you'll pay for it. 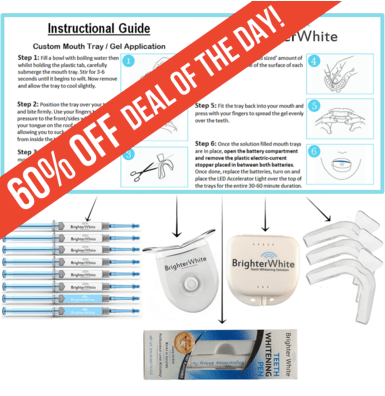 Read more about these systems on our teeth whitening products review page. Teeth whitening entails the bleaching of the teeth to turn them lighter in shade. Time, age, dietary preferences and dental hygiene habits all play a part in discoloring our teeth. Excessive consumption of beverages like coffee and red wine, for instance, can have an impact on the brightness of your teeth. In some instances, long-term use of some medication can also dim the shine on ones teeth. Teeth whitening cannot be done when one has dentures or veneers. The bottom line: Teeth whitening DOES work, however its only the top-of-the-line procedures (such as the smart light KTP system' which will give you the whitest and brightest result. Other methods, such as home-bleach kits can result in great results providing that your teeth are generally in a decent condition beforehand. Read more about home teeth whitening here. The answer is: It depends on the procedure or product used, and how it is administered. Teeth whitening can be initiated with simple products, like hydrogen peroxide-containing mouthwash, where immediate use after consumption of coffee or red wine (for instance) will help prevent the beverages from staining teeth too much. However, if you frequently let the affect of such teeth "darkening agents" fester overnight, then the affects of mouthwash will not last too long either. Other products, such as over the counter teeth whitening strips, could keep the dulling affect of darkening agents at bay for several months. However, regularity of use (as directed by the manufacturer's instructions) is the key to making the impact of the product/process last longer. Many patients prefer dentist supervised whitening procedures, as opposed to using non-prescription products by themselves. Since the products/processes are monitored by professional staff, they can (and do) use ingredients that are more powerful in efficacy. Some of these procedures involve protecting the gums first, and then painting the teeth with whitening solutions, letting the solution sit for periods between 45 minutes and an hour, and then rinsing/cleaning it off. Some dentists administer Laser Whitening which uses a bleaching product, and a laser light that is shone on the teeth, to activate the bleaches' whitening characteristics. The affects of these dentist administered products/procedures may last for as long as two years. However, for the impact to last that long, dentists often recommend follow-up bleaching touch-ups on a bi-annual basis. While Whitening Strips and over-the-counter whitening agents can be used by individuals at home, the most commonly prescribed home teeth whitening procedure is called home bleaching. The process involves several visits to a dentist who is qualified to perform it; and starts off with the dentist creating a tray, that acts as a mouth guard, after taking impressions of the patient's mouth. The dentist also prescribes a whitening agent, often a gel-like solution, which patients can use to fill the tray and wear at home. Depending on the severity of the dis-coloration being dealt with, the tray may be worn anywhere between two and eight hours. The trays are transparent, and can often be worn discretely during the day. Some patients wear them at night while sleeping. These systems are becoming more and more advanced, resulting in better results and whiter teeth with less effort. As a caveat, however, always check with your dentist to ensure whitening is safe for your individual situation before going ahead with treatment. Are you using over-the-counter, non-prescription methods? Are you using home-based dentist recommended treatments? Are you opting for an in-chair procedure at the dentist's office? How pervasive is your whitening challenge? How long is the treatment expected to last? There may also be other cheaper in-chair or home-based options available. Some Spas and manicure/pedicure shops, for instance, offer in-shop or take home teeth whitening kits. The issue with such treatments is that there is no medical supervision on their use, either on-premises or to sign off on the suitability of the home-use products. While these procedures and/or products may work for some individuals, one should always consult a qualified dentist to ascertain whether the ingredients and chemicals used are safe for home use. Some bleaches are extremely harsh, and if not correctly used can burn the exposed surfaces of your mouth (gums, insides of your cheeks). Bleaching can also cause demineralisation of the teeth, and only teeth and gums that are suitable for such treatments should be exposed to them. For more information on teeth whitening visit this page, otherwise check out the Dental Guide Australia Homepage for more dental advice and information regarding dental costs in Australia.